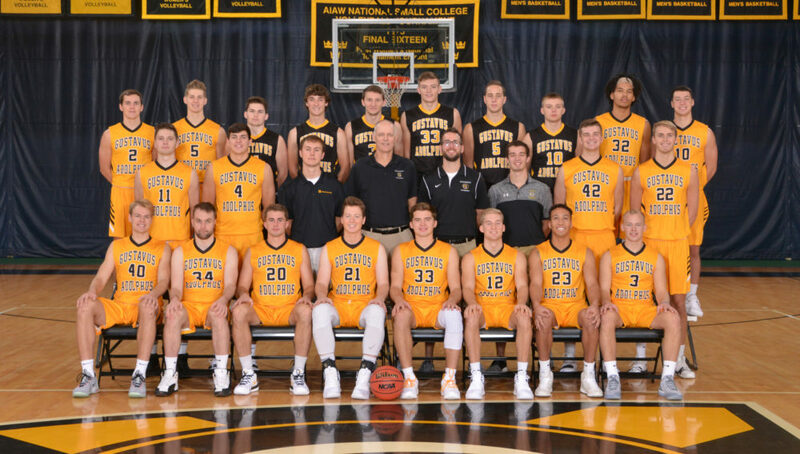 SAINT PETER, Minn. – The Gustavus men’s basketball team is set to begin their 2018-19 campaign this Saturday when they play host to Mayville State (N.D.) for a 7:30 contest. Head Coach Mark Hanson is entering his 29th season at the helm of the Gustie men’s team and his squad is looking to improve on a seventh place finish in the MIAC a year ago when it finished 12-13 overall and 10-10 in the MIAC. The Gusties return two of their top four scorers from last season in Riley Sharbono (Sr., Marshall, Minn.) and Vannis Smith (Jr., Crystal Lake, Ill.). Sharbono, who received third team all-conference honors last season, has led the Gusties in scoring the past two seasons averaging 14.5 points per contest both years. With 913 total points in his career, he is 87 points away from becoming the 33rd member of the Gustie 1000 point club. Smith is the second highest scoring returner, as he averaged 8.4 points per game last season. The Gusties also return four other players who appeared in 20+ games last season. Spencer Tollefson (Sr., New Richland, Minn.) appeared in all 25 games for the Gusties, starting one. CJ Woda (So., Maple Grove, Minn.), Charlier Krambeer (Sr., Rushford, Minn.), and Brandon Snoberger (Sr., Rice, Minn.). all played valuable minutes for the Gusties last season and look to bring that experience back this season. The three captains named for this season’s squad are Sharbono, Snoberger, and Tollefson. As a team last season, Gustavus averaged 68.8 points per game, while allowing 69.0. The Gusties outrebounded opponents by an average of 34.2 to 32.3 last season, but lost their two top rebounders from last season so there will be a void to fill in that regard. The Gusties improved their conference record from 5-15 in 2016-17 to 10-10 in 2017-2018 and will look to build off that this season, but they will play a handful of non-conference games before then and have already played an exhibition. The Gusties will play four non-conference games before they begin MIAC play on Nov. 28th in St. Paul versus Hamline.